Teacher Tom: "Don't Do Anything To Anybody Before You Ask Them"
"Don't Do Anything To Anybody Before You Ask Them"
Well, it's finally started, our 4-5's class has discovered dramatic play games involving guns. For the past couple weeks a girl v. boy game has been brewing. 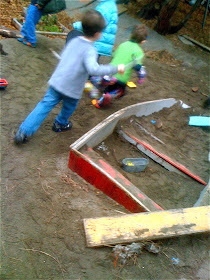 It started with one of the girls agreeing to be chased and "trapped" by a couple of boys and has now spread until yesterday we had a stand-off in the sand pit with everyone pointing weapons at one another. It's not a lot different than the games I played as a boy. It's mostly a game of chase and bravado. In kindergarten the boys chased the girls, sometimes with guns. In first grade the tables were turned when the girls chased us, with the threat of a kiss should they catch us. Last year, the girls discovered the kiss defense and I reckon they will again this year. Don't do anything to anybody before you ask them. Holy cow, what an agreement to make with one another! Yesterday, as the game ramped up, I found myself much more involved with the play than I usually do, as kids, mostly girls, found themselves in uncomfortable positions. It started when I found myself in a group of the boys who were discussing their plans to trap "the girls." I asked, "Do they want to be trapped?" They agreed the girls probably didn't even know, so I reminded of the rule to which they had all agreed. "Oh yeah." There were four of them and as they moved around the playground together asking individual girls if they wanted to be trapped, they met with universal refusal: none of the girls wanted to be chased and trapped. This was disappointing to the boys, who upon finding that their efforts had managed to unify a group of girls who took over the new playhouse, declaring it a "girl's club," retreated to the concrete slide where they consulted amongst themselves. I always have mixed feelings about this. On the one hand, you hate to see girls v. boys, especially when it involves exclusion, even if, as in this case, it may have been justified. On the other hand, there is a certain kind of unifying power found in identifying with classmates through gender. I asked the guys how it felt to be told "no boys allowed," and they answered "Bad." I said, that's probably how the girls feel when you say you're going to trap them without asking first. I don't know if it was this discussion that prompted it or not, but after a few minutes, one of the boys, the "idea guy," lead his crew to the playhouse, saying, "Do you want to be on our team? If you're on our team we won't trap you." Surprisingly, a couple of the girls accepted this invitation, leaving the playhouse to join the trappers, which was no longer a team of boys. Still, with no one to trap, the game eddied into a swirl around the sandpit boat. I checked in with the three girls who remained in the playhouse. They asked if I would help them board up the doors and windows "for protection." Our new playhouse is designed for this possibility and soon all the windows were covered, although there weren't enough boards left to satisfactorily cover the door, which was a good thing because it allowed a couple of the boys to come in, announcing, "We're on the girl's team." We now had two mixed-gender "teams," one that wanted to trap and one that didn't want to be trapped. It was around this time that other duties called me away. When I returned, I found everyone armed to the teeth, brooms, stick ponies, and shovels being used as weapons, one group in the boat and the other aligned outside the boat, all aiming at one another, about a dozen kids altogether. Not all the girls participated, nor did all the boys, and the teams I saw were gender-mixed. I was tempted to once more remind them of their brilliant rule, the one that takes the Golden Rule up a notch by requiring everyone to think not only of themselves, but others. Upon surveying their faces, however, it was clear to me that everyone agreed to be part of this game, which is the way we usually determine "consent" in the larger world. In years past, we have always discussed asking "permission" or "consent" before involving others in our games, especially those that involve more violent themes like shooting or trapping, but this is the first time the kids have pre-emptively created a rule about it without any coaching from adults. It's an easily forgotten rule in the rush and crush of active play, but at least once a day I hear a child's voice saying something like, "Hey, you have to ask me first!" which tells me it's becoming part of our play culture. "Don't do anything to anybody without asking them first." It's an encumbering rule, for sure, one that requires more talking, especially right up front. But it is a democratic rule, one designed to protect the rights of a minority against the tyranny of the majority. I'll be interested in how this one plays out over the course of our year together.